I haven’t been to Smorgasburg in a while — too expensive, too many people, and a pain to get to on the weekends when subway maintenance is often happening. During the winter they have a scaled down version as part of Brooklyn Flea, over at Industry City. This past weekend my girlfriend was hosting some out of town guests, and they wanted to visit the Flea, so we all stopped in for a snack. I finally had my first ramen burger, which usually has crazy long lines at the regular Smorgasburg but on ym visit was practically deserted. The vegetarian version forgoes the burger patty for roasted mushrooms, topped with greens, a sweet garlic-y sauce, and mayonnaise. 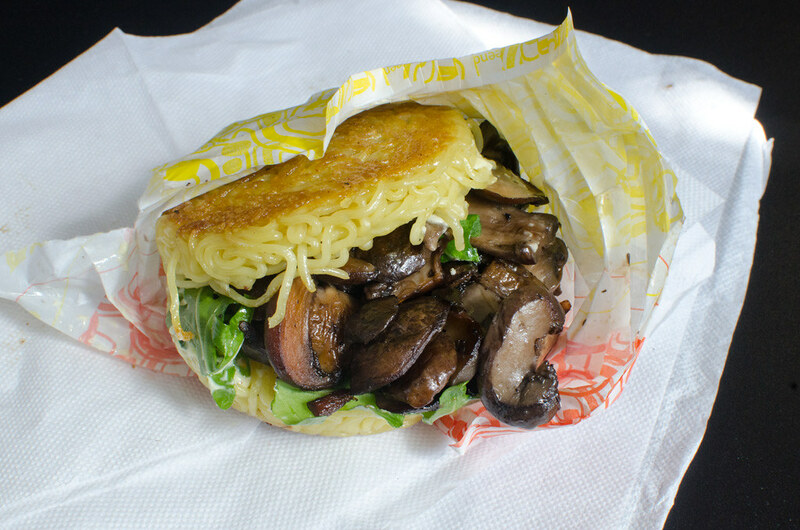 The gimmick is the bun, made with cooked ramen noodles formed into patties and crisped briefly on the griddle. It was tasty, though not worth the $10 price tag. This entry was posted in sunset park and tagged industry city, ramen burger, smorgasburg, sunset park. Bookmark the permalink.